COUNCILMAN Henry, right, congratulates Realtor Louis Rich on Rich’s 99th birthday. Harold Henry Park, tucked away in the quiet Windsor Village neighborhood, is being renovated to the applause of a grateful community. But many people are unclear of just who Harold Henry was, and the many things he did for Los Angeles that directly affected its growth, beauty and livability. Henry was born in Virginia City, Nev., but moved to California after graduating from the University of Nevada. He served in Officers’ Training School in 1918, and later became executive secretary of the Western Avenue Business Association. He took a leading role in spearheading basic improvements to the Wilshire District. In 1937, Henry reorganized the Association into the Wilshire Chamber of Commerce. In 1938, he was appointed as a member of the City Playground and Recreation Commission by Mayor Fletcher Bowron. 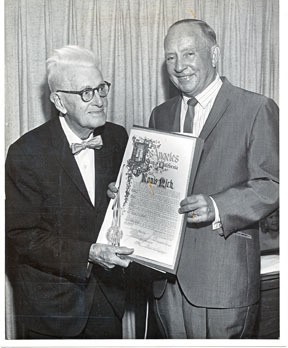 He served as councilman for the Fourth District beginning in 1945, where he created parks, amended building height limits on Wilshire Blvd., formed the Wilshire Police Division, established libraries, and founded one of L.A.’s longest standing newspapers, the Wilshire Press. 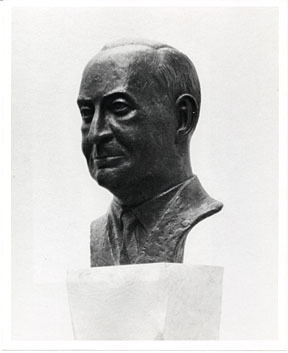 BUST of the park’s namesake. As the councilman for the Fourth District, Henry focused on widening and improving principal traffic arteries such as Melrose Ave., Beverly Blvd., Wilshire Blvd. and Olympic Blvd. The widening of Wilshire Blvd. was another of his achievements. Henry also oversaw the installation of storm drains, sewers and the ornamental lighting of most major boulevards. He helped create several new parks and playgrounds, including Robert Burns Park at Beverly and Van Ness and the West Wilshire playground and swimming pool. 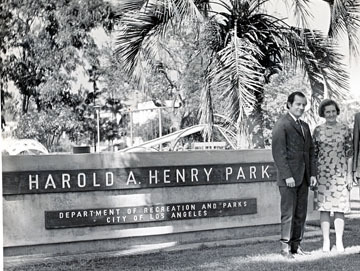 AT PARK DEDICATION in 1966 are bust sculptor Henry de la Vega and Henry’s secretary Vivian Van Ausdall. Henry instituted repaving and lighting Larchmont Blvd. and developed measures of safety for pedestrians by installing crosswalks on Larchmont Blvd., Fairfax Ave. and other major streets. One of Henry’s biggest achievements was enacting two new commercial zone classifications, which have been vital in protecting Wilshire Blvd. against encroachments by developers. Before his death on May 1, 1966, Henry was named “Mr. Wilshire Center” at a ceremony where many locals paid tribute to his achievements and legacy.